As part of The National Trust’s Playful Landscapes contemporary art programme, London Fieldworks re-imagine the lost architecture of Clumber Park and an aristocratic menagerie. Two new commissions by London Fieldworks (artists Bruce Gilchrist and Jo Joelson) will transform the grounds of Clumber Park, a National Trust property in Nottinghamshire. The former estate of the Dukes of Newcastle was once site of a grand country house that was demolished in 1938. 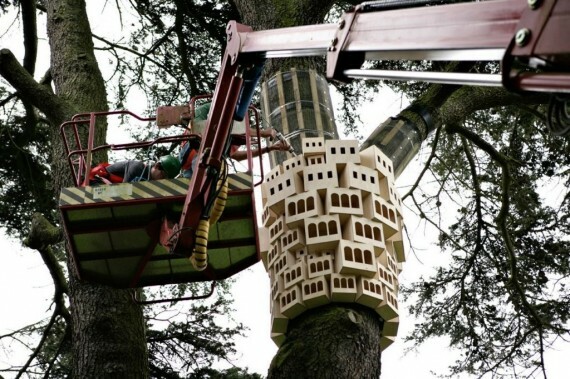 Spontaneous City in the Cedar of Lebanon – a series of mansion blocks for birds located in one of the park’s vast cedar trees – takes ‘The lost house of Clumber’ as its theme, while The Leopard references the estate’s aristocratic menagerie, a collection of exotic and rare animals from around the world. An earlier incarnation of Spontaneous City in the Cedar of Lebanon featured in a-n’s Collaborative relationships series, when London Fieldworks and curator Emma Underhill discussed their project to create a sculptural bird habitat in two London gardens. The cluster of bird boxes at Clumber Park takes inspiration from the elegant rooms of the former house, redesigned to accommodate the park’s avian residents. The Leopard looks to the Fourth Duke of Newcastle’s own collection of exotic animals. Lazing contentedly on a tree branch, it has seemingly transformed into a kind of chaise longue, making reference to the fine Regency furnishings of the former house. A specially designed observation platform enables visitors to view The Leopard. Playful Landscapes forms part of Trust New Art, a programme developed in partnership with Arts Council England. In 2012, over twenty new projects are taking place at National Trust properties across England. The National Trust has now committed to a further three years of projects at properties in England, Wales and Northern Ireland. London Fieldworks at Clumber Park, Worksop, Nottinghamshire, S80 3AZ, 4 August through to winter 2012, daily from 10am – 5pm (normal admission charges and membership details apply).